Carnival, as always, is a blur; the payoff this year was a trip to Italy to meet Jô Iazzetti, my better half and producer. Rome, Perugia, Siena, Florence, Castelnuovo di Garfagnana, Pisa, and back to Rome. Ten days of sheer pleasure. Hopefully I'll get some pics up soon. Then, it was ten days on the road with Irvin Mayfield and The New Orleans Jazz Orchestra - playing alto and clarinet, then tenor and soprano. Got to hang with such luminaries as Mr. Mayfield, Vincent Gardiner, Rick Stepton, and of course the all-star talents of the NOJO! Back in NO, it's festival time! There's the Latin American Festival at Nicholls State University, the French Quarter Festival, and the New Orleans Jazz & Heritage Festival. Trio de Janeiro performs Saturday, April 14 at the FQF, and Ray plays with the Al Belletto Big Jazz Band on Sunday, April 15 (see calendar). On Sunday, May 6, Ray performs with Don Vappie and the Creole Jazz Serenaders at the NOJHF. 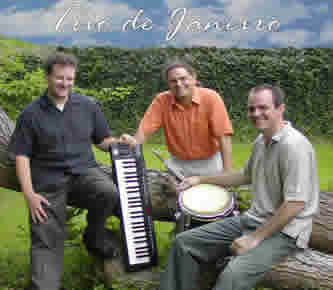 Trio de Janeiro (Ray Moore, Mike Lemmler, and Wayne Maureau), begun in summer '05 shortly before the storm, is pursuing the musical direction begun by Brasilliance!. With a new emphasis on samba-jazz, bossa nova, and MPB without forgetting the music of Hermeto and his disciples, T de J enjoys a musical freedom thanks to the incredible piano and left-hand bass work of Mike Lemmler and the masterful interpretation of Brazilian grooves by Wayne Maureau. Trio de Janeiro bio and photo here. See the Calendar for upcoming T de J dates. Ray appeared in the Cote Blanche production "An American Creole", aired nationally on PBS around the one-year anniversary of Katrina. This documentary, available on DVD, follows serious NO musician Don Vappie as he organizes a star-studded family reunion in the wake of Katrina. Great music and a poignant look at how New Orleanians refuse to let go of their culture. Thanks, Don, for your artistry and perserverance! Ray performed in Rio de Janeiro, Brazil in September in the final two concerts (September 25th & 26th) of the series titled Encontros Rio-Orleans (Rio-Orleans Encounters), at the Cultural Center of the Bank of Brazil (CCBB). The series brought together musician/composers from Rio and their Crescent City counterparts. For the final concert, Ray shared headline duties with Brazilian saxophonist Leo Gandelman and backing musicians (including friend/colleague Pascoal Meirelles on drums and new friend Itamar Assiere on piano) from Rio. Ray featured compositions from modern New Orleans jazz masters Harold Battiste and James Black in addition to his own composition Minas. Leo played music from the late Carioca composer Radamês Gnattali, featured on his new CD Radamês no Sax (with series musical director Henrique Cazes). Also in September, Ray made music again with Italian-born pianist extraordinaire Dario Galante at Esch Cafe in Rio and in October hit the road to the state of São Paulo for a 'mini-tour' of SESCs there, and to give a masterclass at Faculdade Souza Lima in São Paulo capital. Ray played at Bar Ao Vivo in SP, SP with students from Souza Lima. Photos from FSL and Bar Ao Vivo here. The final show in Brazil was with RiOrleans (Dario Galante, Tony Botelho, Pascoal Meirelles) at Espaço Bis in Rio. A grand farewell. Que saudade!